A delicious pasta recipe taken from our ‘Classic Italian’ cookery course. 1. Place the pasta flour in a food processor and, with the motor running, add the egg yolks. Stop blending when the dough comes to a coarse breadcrumb consistency — don’t overwork the dough to a single mass. 2. Remove the coarse crumb from the processor and bring together by hand. Knead for 10-15 minutes until you have a smooth dough — it should be supple and slightly soft but not sticky. Wrap the dough in cling film and rest in the fridge for at least 30 minutes. 3. To make the filling, mix the spinach, ricotta, Parmigiano Reggiano and egg together in a bowl until well combined. Season with nutmeg and salt and pepper to taste. 4. Roll out the pasta dough with a pasta machine until wafer-thin and silky, then cut out 12 x 10cm discs. 5. Brush one pasta disc with a little cold water and place a scant teaspoon of the spinach and ricotta mixture on top. Fold the pasta over the filling to create a semi-circular parcel. Press firmly to seal the edges. Brush one end of the parcel with a little more water, bring the two ends of the parcel together and secure firmly. Repeat the process with the remaining filling and pasta discs. Allow the tortellini to rest in the fridge for 5 minutes. 6. Cook the tortellini in plenty of boiling, salted water for 3-4 minutes or until they have risen to the surface. Drain well and serve immediately. 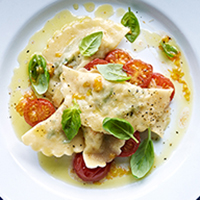 Chef's tip: These tortellini are delicious served with fresh basil pesto.